Police have detained 47 people accused of making or selling fake infant formula that led to the deaths of dozens of children in an eastern Chinese city, the government announced Monday. 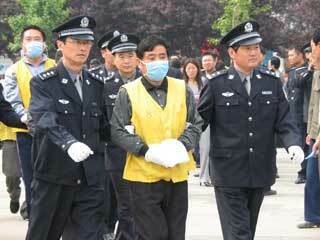 The deaths prompted a national crackdown on safety violations in China's food and drug markets. Xinhua News Agency reported 13 children, mostly from poor farm families, died of malnutrition in the city of Fuyang after being fed the bogus formula, which contained only tiny amounts of nutrients. Among those detained, 24 have been formally arrested, according to a statement by the Fuyang city government. The detentions were announced at a public ceremony Sunday where authorities destroyed 4,425 seized boxes of counterfeit formula, according to the statement. The announcement didn't identify those detained or give details of the charges. Authorities earlier announced that they had detained five wholesalers who supplied the fake formula sold through village grocery stores on the outskirts of Fuyang. State television reported earlier that counterfeit milk powder and undernourished infants had also been found in the neighboring provinces of Shandong and Henan. Reports said as many as 200 babies who were fed the formula developed what Chinese doctors called ``big head disease,'' causing their heads to swell while their bodies wasted away. The symptoms are like those of edema, a buildup of fluid that is a feature of starvation. 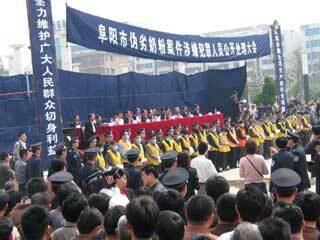 The cases in Fuyang was first publicized on April 22. The next day, Premier Wen Jiabao ordered a thorough investigation and ``severe punishment'' for those found responsible. Police have raided scores of markets, reportedly confiscating thousands of bags of fake milk powder made under 45 different brand names by 141 factories scattered across China. The government has promised the family of each dead infant 10,000 yuan (US$1,200) and ordered local authorities to help pay the medical bills of hospitalized children.